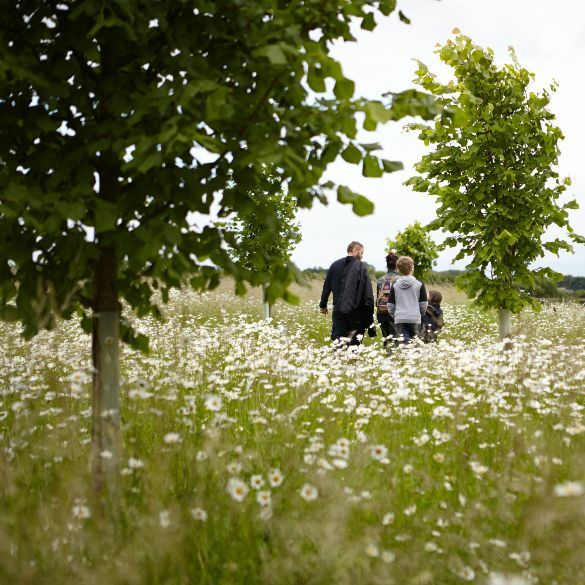 Why natural or green burial? The chances are you will be familiar with a traditional church or council cemetery burial or a service at the crematorium. Increasingly popular but still less well known is a green burial or ecoburial. We find a lot of people come to a funeral at Westmill and tell us afterwards that they didn’t really know what to expect but once they understand how it works they think they might like one for themselves. And of course it is not everyone’s cup of tea. Green burial grounds have been around in England since Ken West tried out the first one as an experiment up in Carlisle council cemetery in response to requests for a more natural setting from his customers. That was back in 1993 and now there are well over 350 with more being created each year. Some are small and extremely simple with no facilities and animals grazing on site. Others have full facilities and are very large. Many, like us, are somewhere between those two extremes. They range from meadow, woodland and seaside locations and are sometimes run by local councils, ecology groups, religious groups, farmers and other private individuals or organisations like ours which is a Community Interest Company. They have a much less damaging effect on the environment. No large stones, no tarmac or even gravel paths. The creation of a beautiful, peaceful site for families to visit. Your family are part of creating a memorial nature reserve for the enjoyment of people, plants and animals for generations to come. No harmful pollution going into the air. No massive energy use as in cremation even with the newly improved cremators. The use of biodegradable coffins and control over the use of chemicals going into the ground prevents harm to wildlife and soil quality. You really do go back to nature. A more relaxed pace enabling you to have the funeral you want without feeling the next funeral queuing up behind you. Minimal upkeep requirements for anyone. And we are still properly regulated as we are members of the Association of Natural Burial Grounds which is part of the Natural Death Centre. Visit www.naturaldeath.org.uk to find out more about this amazing charity. There is no question they cannot answer and they tirelessly campaign for people to get reasonably priced, environmentally friendly and personal funerals.